Superman is a fictional character, a comic book superhero appearing in publications by DC Comics, widely considered to be an American cultural icon. Created by American writer Jerry Siegel and Canadian-born artist Joe Shuster in 1932 and sold to Detective Comics, Inc. in 1938, the character first appeared in Action Comics #1 (June 1938) and subsequently appeared in various radio serials, television programs, films, newspaper strips, and video games. With the success of his adventures, Superman helped to create the superhero genre and establish its primacy within the American comic book. 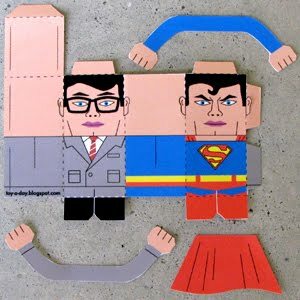 Download the PDF file here and make your own Superman/Clark Kent! 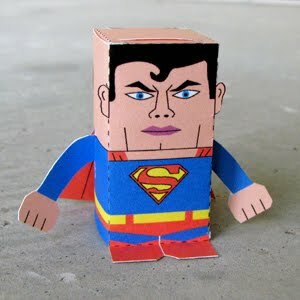 Wow, this is really super! Is it me, or is there no email for contact on your site? Anyways, I'd like to recommend Toy-a-Day in the next issue of German family mag LUNA and wanted to ask for some pictures in print quality. 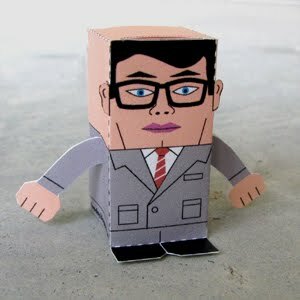 You could send them to susanne@onthesubjectof.de. My deadline is on sunday, so I hope to hear from you.